A simple way to enhance a colorful garden is by adding some dramatic-looking black flowers. The resulting contrast can make a bold statement and create a memorable garden. There are no true black flowers when you analyze their dark hues. 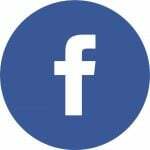 They usually only closely resemble deep shades of purple, burgundy or maroon which give off an intensity similar to black. 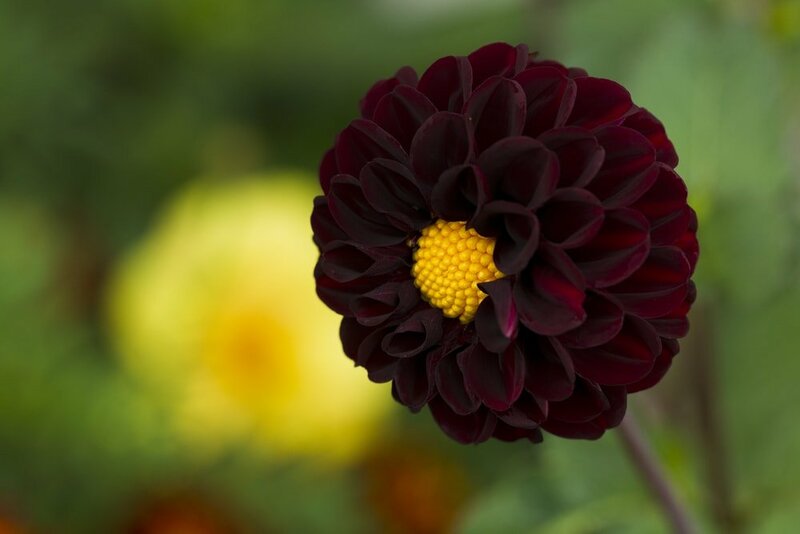 Black blooms look more beautiful with a hint of purple or red which helps them fit in better in the garden. Black flowers come with some moody vibes that can transform your garden with their elegant touch. Certain types of flowers can enhance an area with their tropical look and will enhance the overall look together with more vibrant flowers. If you enjoy the idea of creating a more expressive garden, planting some black flowers represents a must-have addition. Take a look at the best options for incorporating some darkness into any garden. While regular hollyhocks can enhance the look of any garden, black varieties will take the dramatic effect to a new level. 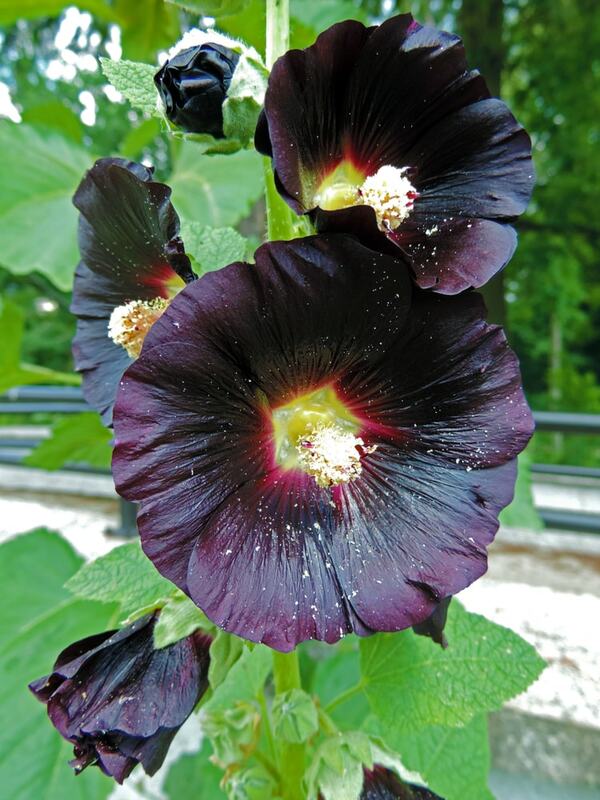 The dark purple color of the black hollyhock creates a mysterious look for this flower. The onyx petals contrast with the creamy white center where lots of bees like to settle in their search of nectar. 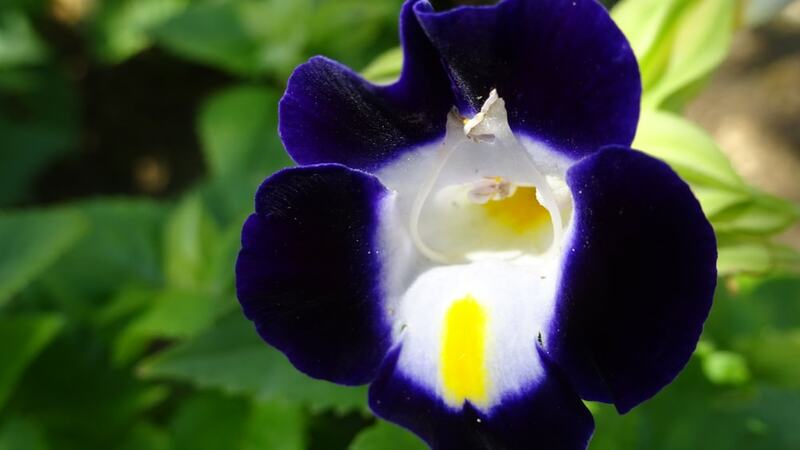 Towards the center of the flower, the color reaches a deep shade of purple that appears black from certain angles. This is not a difficult flower to grow as you can successfully plant it in a variety of climates without problems. The black hollyhock can grow quite tall so you might have to use stakes to keep their stalks steady. The bearded iris is a garden staple in many places and you can find it in almost any color you can think of. 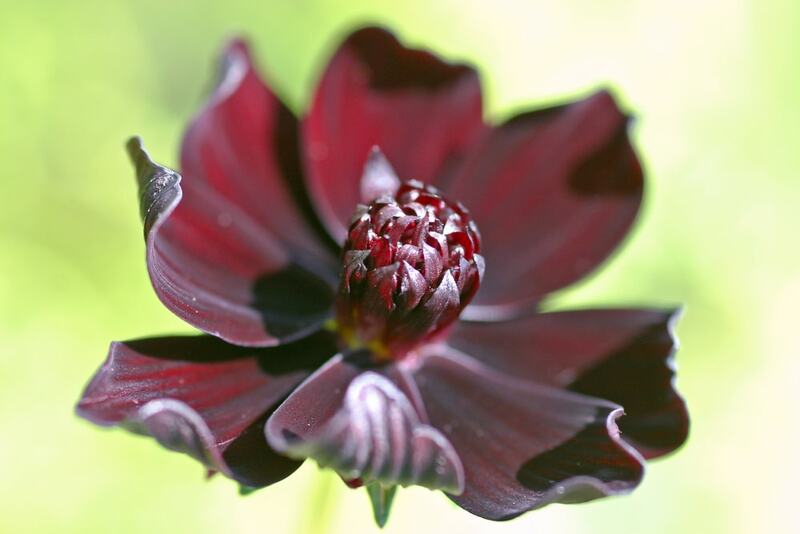 There’s also a black variety with dark purple petals that show off an exotic design. 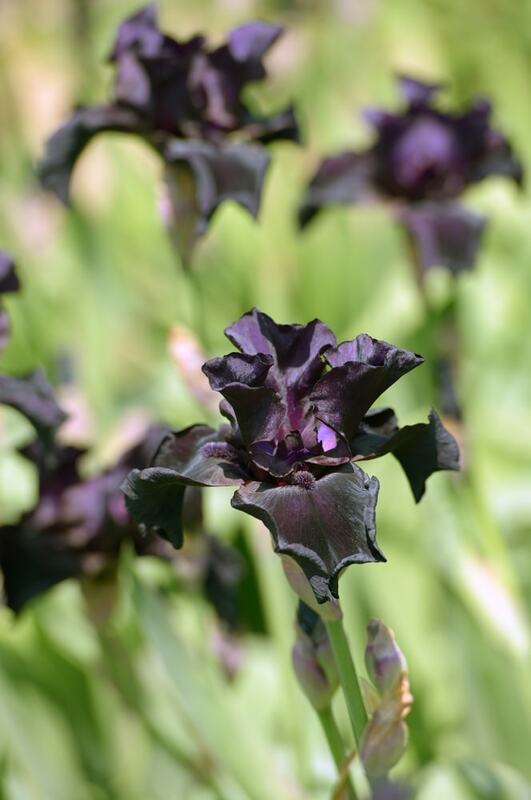 Also known as the Old Black Magic iris, this flower produces a slight fragrance and needs well-drained soil and plenty of sunlight to thrive. Gardeners in zones 3-10 will have the most success when it comes to growing this type of iris flower. This could be a stand-out black flower in your garden considering the elegant color that shimmers in the sunlight. As its name suggests, the black iris has some orange touches that resemble beards on each bloom. Pansies are known for being hardy annuals meaning they are capable of resisting freezes quite well. You can find these flowers in a multitude of varieties including black ones. 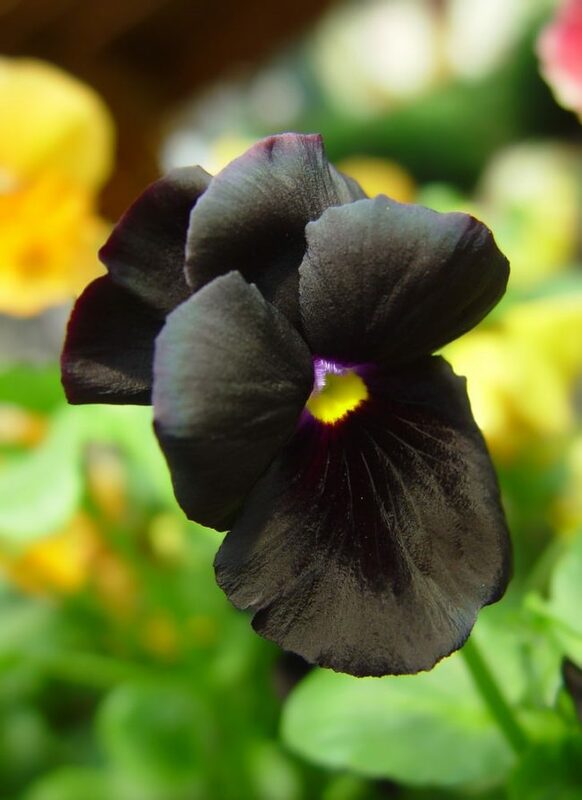 The Black King pansy is a dark purple flower with a yellow center that adds a distinctive touch. Flowers will appear from spring to fall when it comes to this type of pansy. 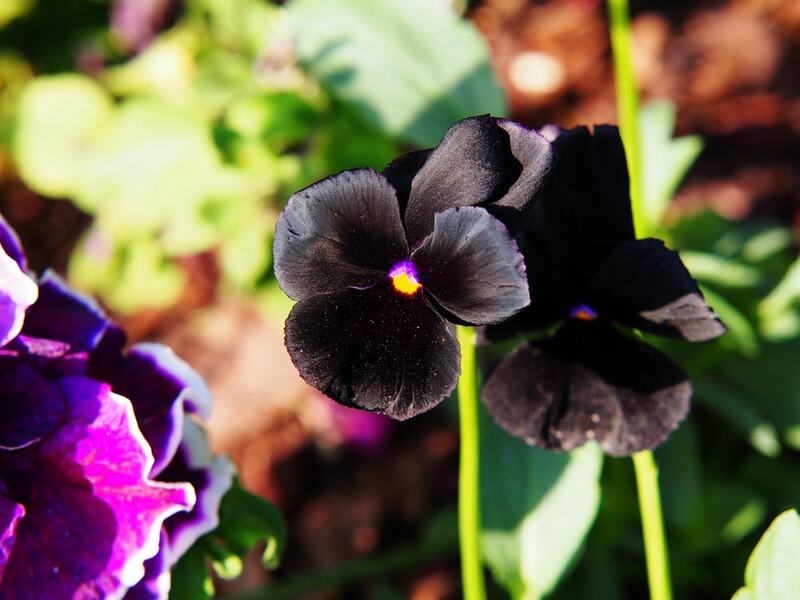 To make the black color stand out some more, consider planting the Black King pansy together with vibrantly-colored varieties. Yellow pansies, in particular, should look brilliant when combined with this black flower. 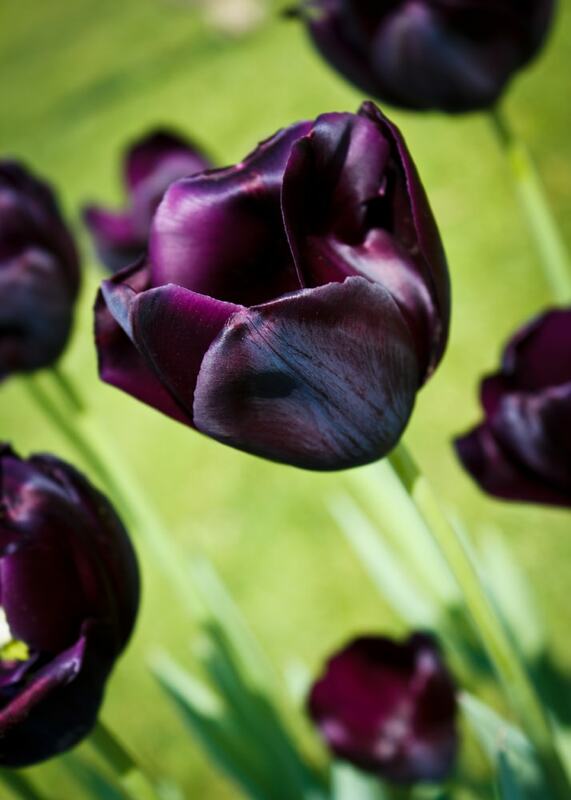 One of the most dramatic black flowers that you can integrate into your garden is the Queen of the Night tulip. This plant blooms in late spring showing off a deep maroon which goes well together with lighter-colored tulips. Similar to other tulips, this black flower is quite simple to grow. You can have the Queen of the Night tulip thrive in lots of climate zones from USDA area 3 to 8. Make sure you plant more than a few tulips as spring bulbs will look more attractive when they’re more numerous. A native of South Africa, the Black Calla lily prefers hot and humid areas. This is a stunning flower that could be a perfect addition to decorate a garden. 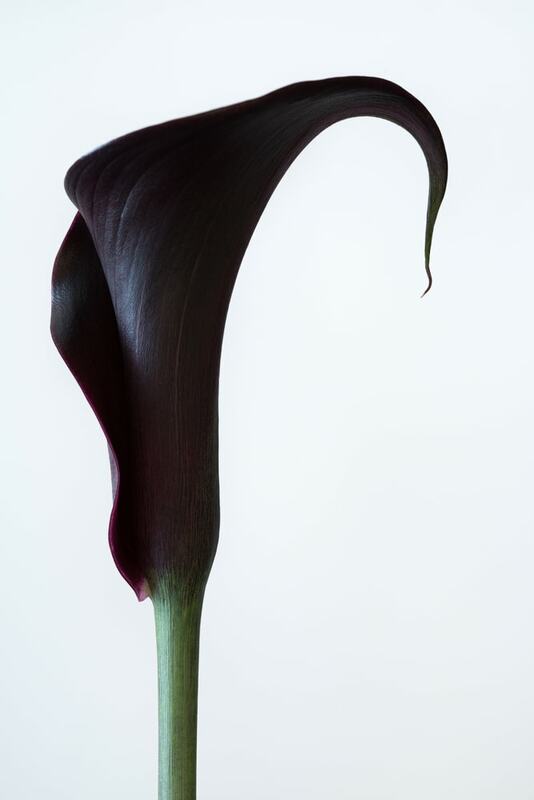 When in full bloom, the Black Calla lily draws attention through its deep purple look that forms a stark contrast with the light green foliage. The flower grows pretty fast, so you can have it become a focal point in the garden in no time. There’s a hint of red on the tips of the petals and that might enable it to attract hummingbirds. The Black Calla lily produces flowers from mid-summer until freezing temperatures start to appear. There are few black flowers with a more distinctive look than the bat flower. This is a rare exotic flower that resembles the look of a flying bat. The sooty hue combines with a unique design to create a truly mysterious visual impression. 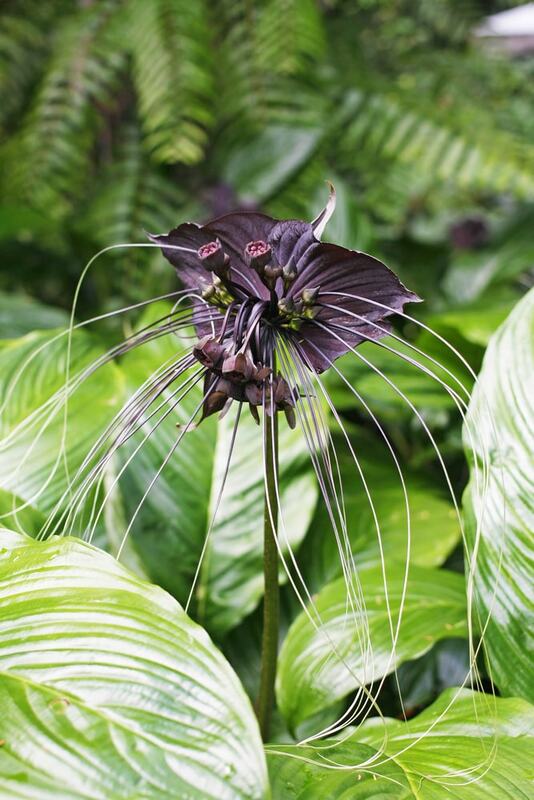 Those who like flowers with a more interesting personality will probably adore the look of the black bat flower. In terms of thriving requirements, select a very warm and humid spot to mimic the warm subtropical weather. If your outside area is too cold, the plant can be grown inside more successfully. Hellebores sometimes come in dark burgundy or deep purple varieties that come close to a black look. This flower is known for being able to bloom quite early in the spring so it can make a bold statement right away. The plant itself is evergreen so it’s capable of handling more difficult conditions like dry shade. 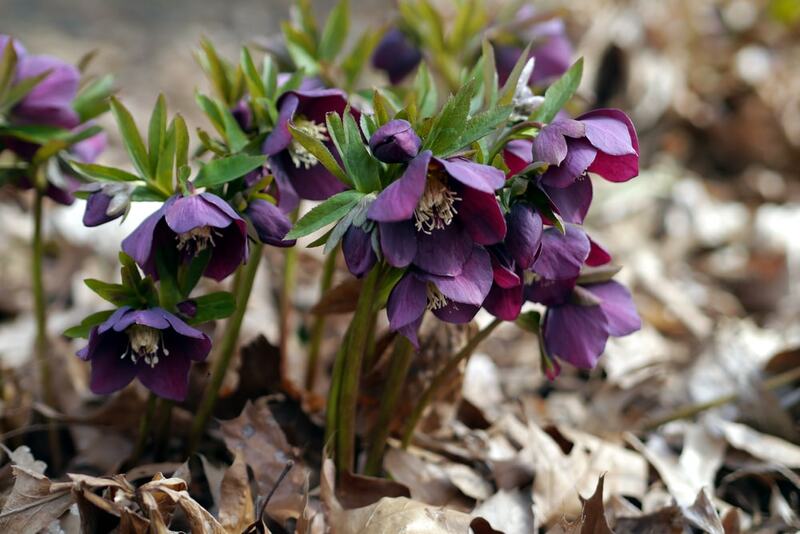 The dark purple hellebore can thrive if you take proper care of it. That usually means adding some compost and watering it very regularly. The next spring you might discover a small colony of black flowers waiting to bloom and create a fresh look in the garden. These boisterous flowers also come with varieties in darker shades with dark maroon petals that surround a yellow stamen. Dahlias make superb cut flowers so your garden should definitely include them. This deep-burgundy variety will appear black in the shade, but you need to keep in mind the plant’s needs. To grow healthy dahlias you need to allow them to get full sun at least until the afternoon. It’s also recommended to plant this flower in warmer climates. 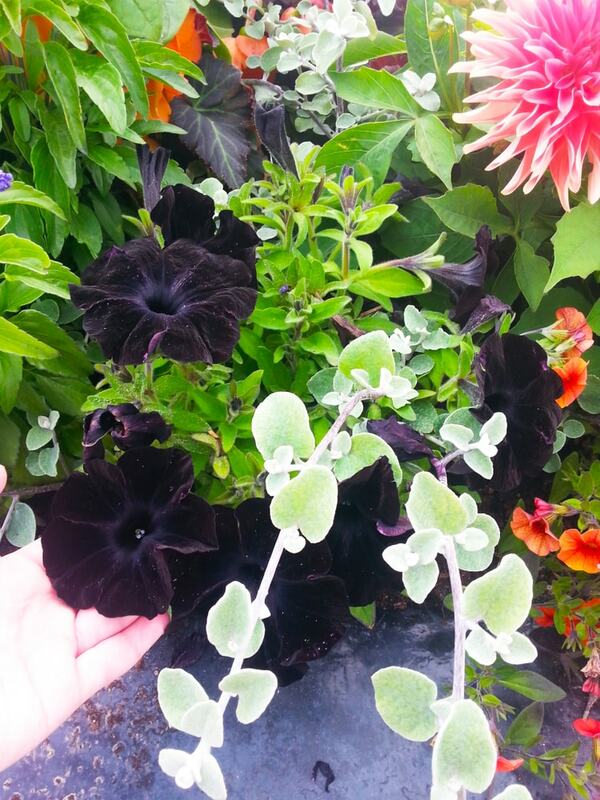 With an almost black appearance, the Black Velvet petunia is another great candidate to consider incorporating into your garden. It’s not easy to find the right seeds for this variety, but the results will be very rewarding. This flower gets its name from the texture of its petals that closely resembles velvet. The dark flowers of this petunia are actually closer to deep burgundy. There’s a wide range of growing options available for the Black Velvet petunia as you can locate them to beds, borders, pots, and boxes. The star outline formed by the shape of this flower gives it a unique look. While the original carnation flower comes naturally with bright purple petals, there are some darker varieties that add a touch of elegance to the garden. Cultivars managed to create some deep burgundy varieties of the Dianthus caryophyllus. 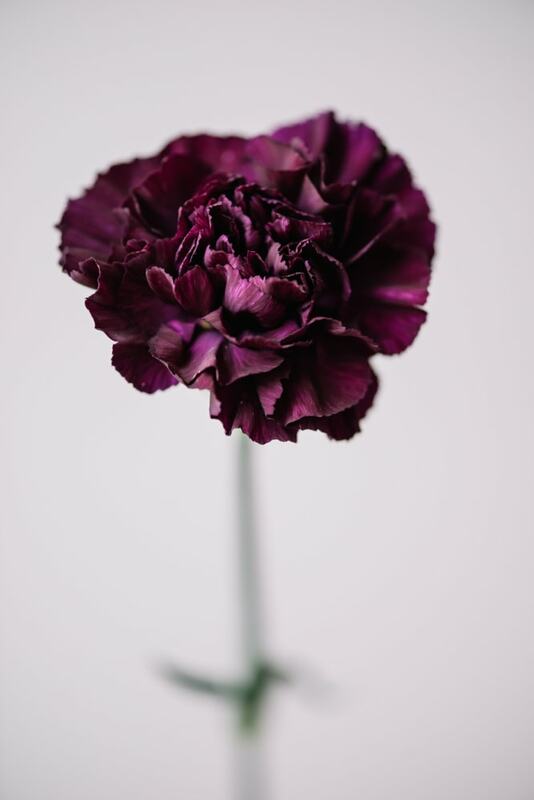 Combined with the radial symmetry of the petals, the dark color of the carnation looks very attractive. Getting this plant to grow healthily isn’t very difficult as long as you keep it in well-drained soil and full sun. These flowers also have a distinctive fragrance. 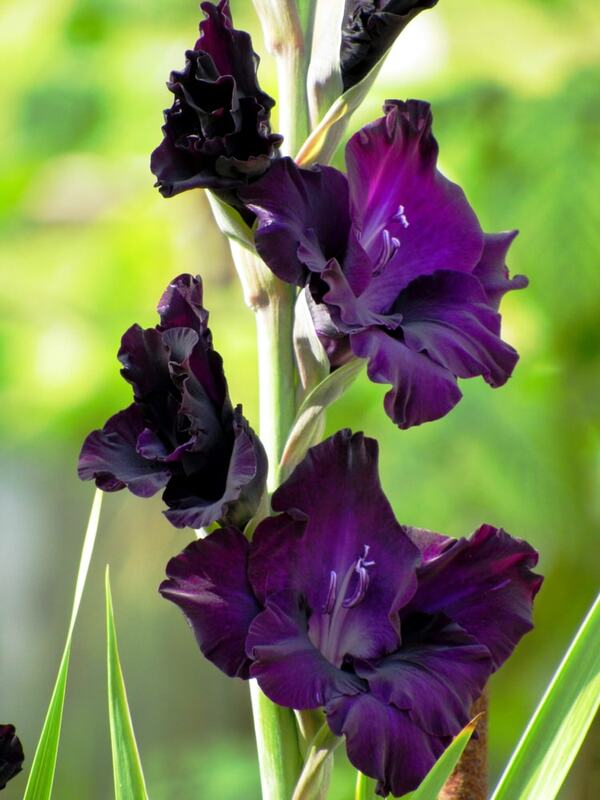 Some gladiolus varieties showcase some particularly dark hues of purple and burgundy. This is a very fresh-looking flower that displays its blooms on a long stem making it ideal for all kinds of floral arrangements. The gladiolus symbolizes generosity and sincerity. This dark purple variety is a stunning take on this garden favorite. It could be a dazzling addition to a wedding bouquet or an impressive flower to plant in your garden. The gladiolus doesn’t require too much gardening experience as even novices can learn to grow it without issues. Native to the Eastern Mediterranean basin, the Arum Palaestinum comes with a sophisticated look that’s sure to impress. 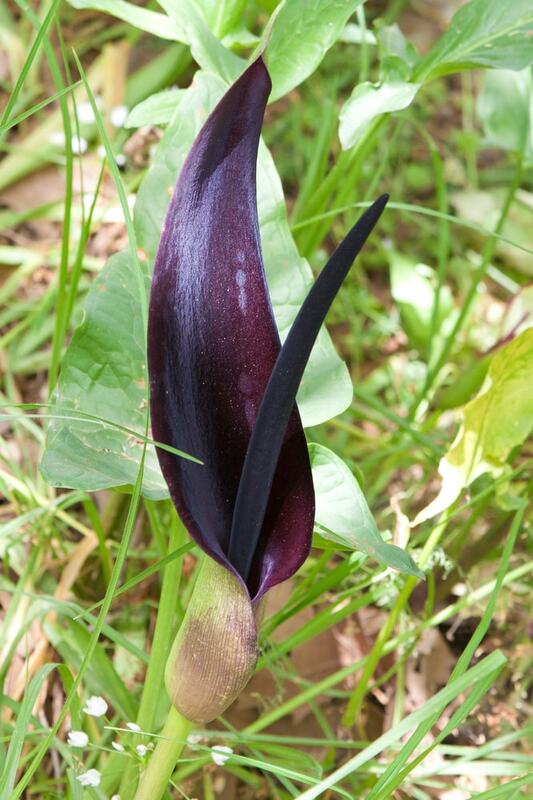 The most recognizable feature of this flower is the dark purplish-black cone that has a delicate character. There’s also a large petal surrounding it that completes the elegant design. Even though Chocolate Cosmos disappeared from the wilderness, it still exists thanks to cultivars. The highlight of this flower is the vibrant dark maroon color which makes a lovely pairing to the slight chocolatey scent it produces. The Chocolate Cosmos can handle both full or partial sun, but it doesn’t have great resistance to frost. It’s used to warmer climates so you should consider planting it if you’re in USDA zones 6 to 11. If you can manage to grow this black flower successfully, the result will be very rewarding. Both the large and small petals of this flower have a stylish metallic hue. Colocasia Black Magic which is commonly referred to as the Elephant Ear and it represents a nice option if you want to grow a tropical plant with a unique design. It has dark purple leaves that can form the ideal backdrop for more brightly-colored flowers around it. As long as you keep the Elephant Ear in a warm environment full of sun, it should be able to thrive. This could be an ideal addition in a large garden to fill up some unused space. 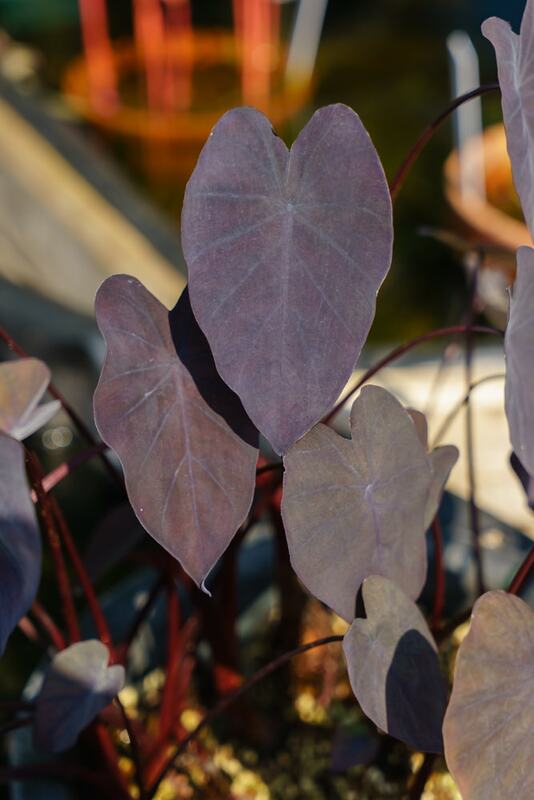 The leaves resemble dark purple lily pads and some of them can have faded green tones. 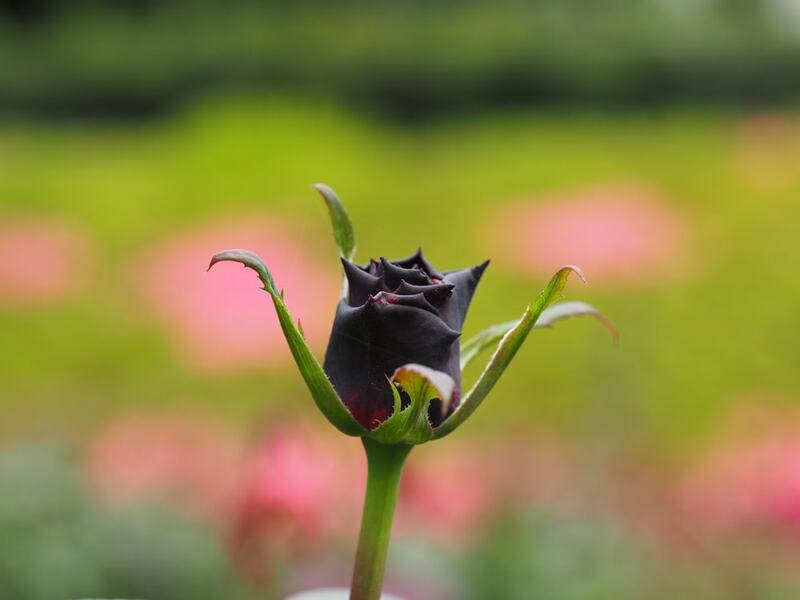 The stunning Black Baccara rose is one of the most impressive black flowers to include in your garden. The dark purple tone is close to black and the bloom will delight you with its charming fragrance. Cooler weather might be more suitable for this rose to display its dark color. 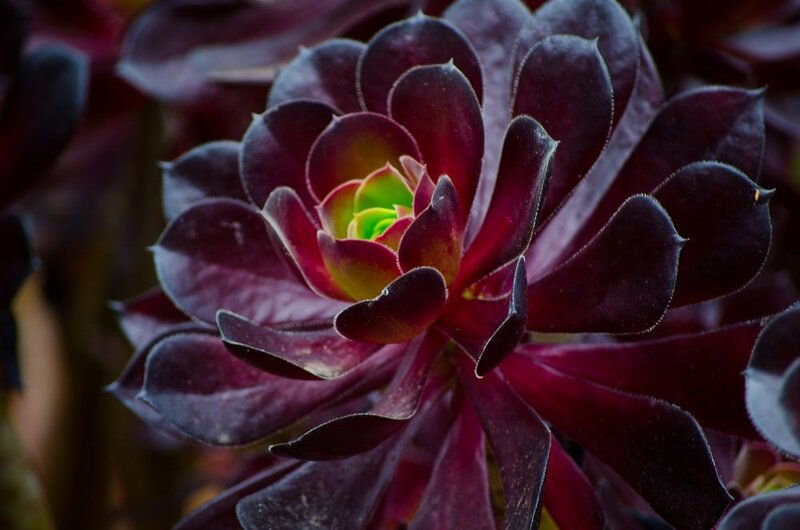 Also known as the Irish rose, the Aeonium Arboreum is actually a succulent plant with yellow flowers. A very appreciated cultivar of it is called Zwartkop and shows off a uniquely dark design. Native to the Canary Islands, this plant seems like a decent match if you want to add a dramatic effect to your garden. The deep burgundy leaves surround a pale center to create a brilliant contrast. 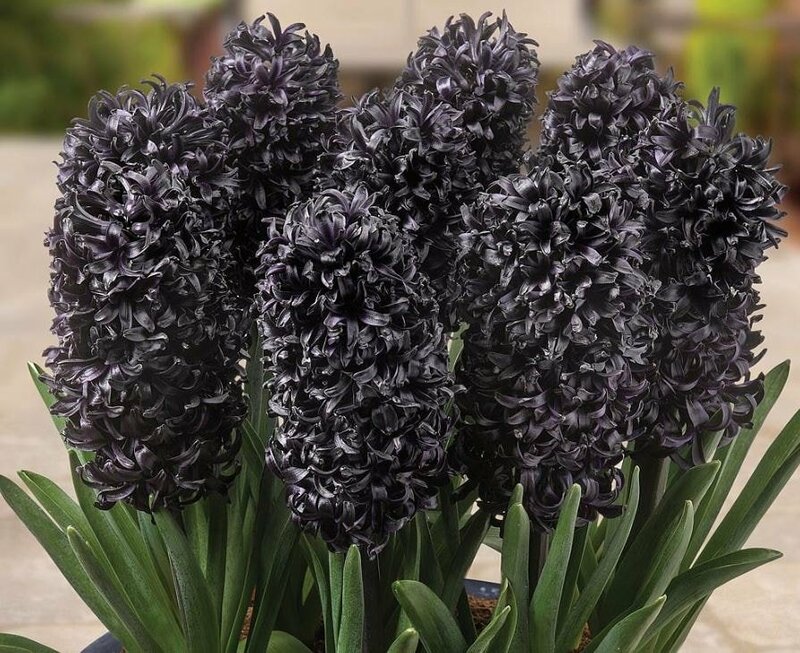 Hyacinths don’t usually come with such dark colors, but the Midnight Mystic variety offers a unique display. This is known as the first black hyacinth popularized by the Chelsea Flower Show in 2005. The breeding process for it took a few years and the result is simply beautiful. This flower also has a great scent to complement the deep purple aesthetics. Whereas for growing possibilities, there are lots of options to consider. Bulbs can be planted in beds and borders as well as in patio pots. If you wish to obtain the darkest black blooms, it’s strongly recommended to let the plant grow outdoors. 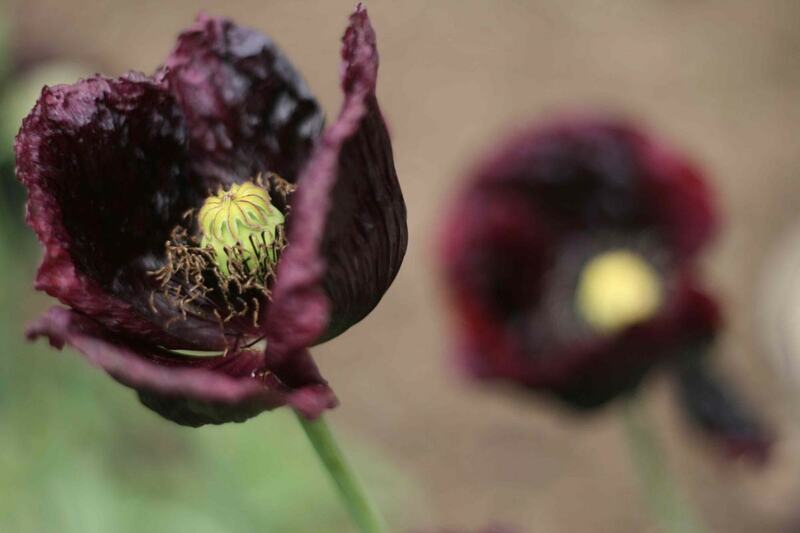 One of the most mysterious-looking poppies from the oriental family is this Midnight variety. The petals of this flower get fairly close to a black hue, but the dark effect is more noticeable in the shade. This hybrid flower can be found as seeds to purchase, so that means you can do a large garden makeover with the help of their stylish design. When the poppy blooms you will also notice the seed capsule that has a frizzy appearance. The flower has a 30-inch stem and produces a firm taproot. It’s recommended to place them in sunny spots with rich soil for ideal growing conditions.